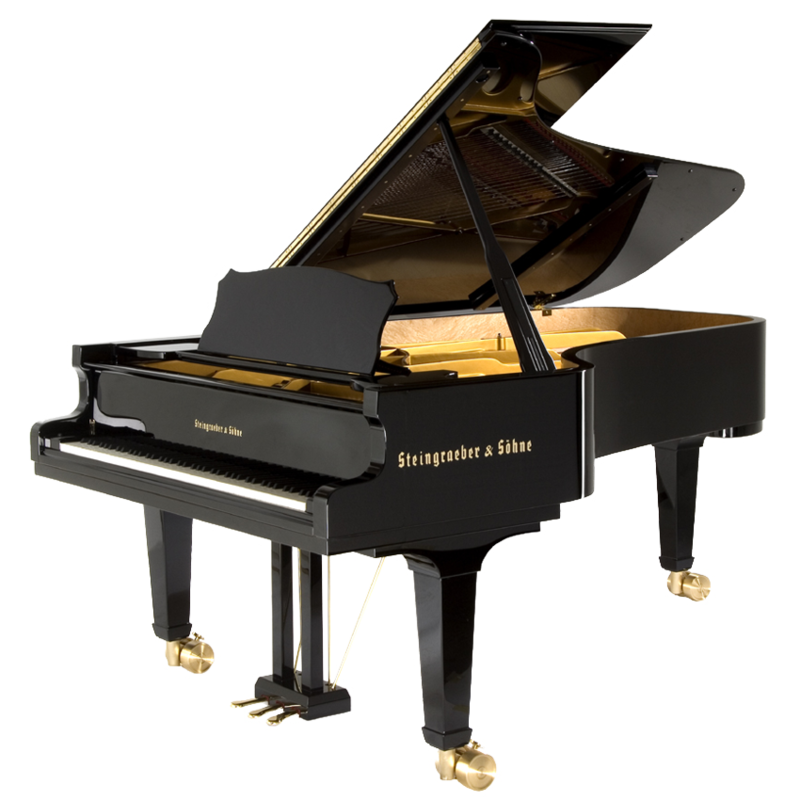 The new Steingraeber & Sons D-232, the “little brother” of the E-272 concert grand, was introduced at the 2008 Music Exhibitions in California, Frankfurt and Paris. The family resemblance is immediately apparent in the shape of the outer rim. Both the D and E models include the same excellent acoustic features, such as the symmetrically shaped rim with a sound reflection zone at the rear, unique plate design which eliminates forward cross-braces and precisely limited sounding board area – the result is a tone that is present and singing. – the D-232 has the lightest top lid of any grand piano, up to 33% lighter than industrially manufactured lids, which contributes extra overtones to the core sound. – the capo d’astro bar extends across forty-six unisons to just above the middle of the keyboard, thereby encompassing the largest pitch range of any piano. This concept is unique to Steingraeber and is offered nowhere else in the world. Only forty-two unisons pass through agraffes! Clearly, the goal of Steingraeber’s piano builders is to give even greater brilliance and reverberation to the wonderfully singing tone for which Steingraeber pianos are already famous! It goes without saying that the “7-foot-7” (as the D-232 is called in America) also comes with a well-known Steingraeber specialty, the drilled capo d’astro bar. This creates little bridges between every tone from the bar to the plate, adding structural stability and contribute to the exceptionally long sustain. The D-232 is a classic, professional concert grand piano through and through. Special features, including rolling knuckles and the innovative Phoenix system of patented bridge agraffes for efficient energy transmission, will soon be available for this new model, just as they are for other Steingraeber grand pianos.